Please note, you must pay for each guest you register. 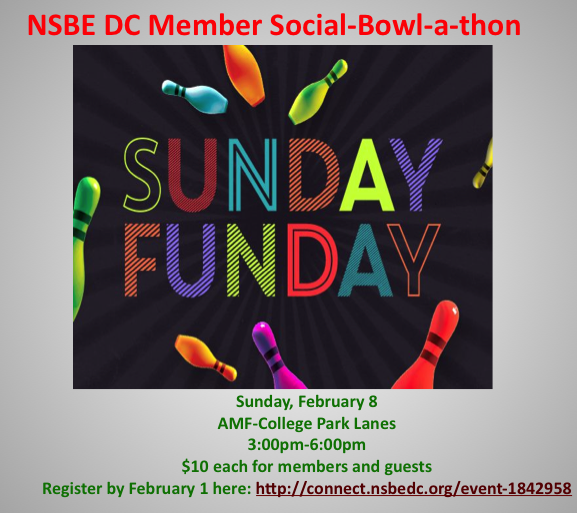 Join NSBE DC for our February member social at the AMF-College Park Lanes for some fun, eat and fellowship on Sunday, February 8. We are reaching out to past members/leaders to join us and partake in our family fun. Register by Thursday, February 5th. Cost is $10 each for members and their guests and children. We will be selling the 25th Anniversary T-shirts and sharing information on the upcoming Walkathon Scholarship Fundraising and 25th Anniversary Weekend Celebration events.